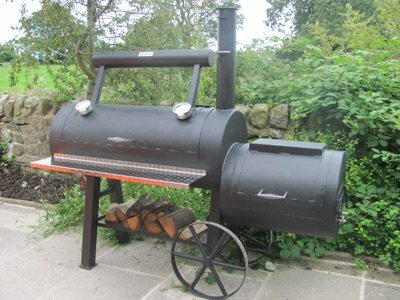 I believe that I make the best offset American smokers UK manufactured using 3mm & 6mm solid steel. A state of the art reverse flow design, I try to bring the taste of true American back yard BBQ to your garden patio. Have a work of culinary art in your garden that will knock your friends and neighbours for six! At the end of the cookout, simply stoke the fire and keep warm as your evening outdoors draws to a close. 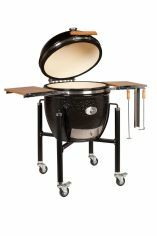 With our Tennessee model you can also grill over the embers in your firebox too. 3mm painted solid steel construction, fully welded with heavy duty lids. My smaller "Kentucky" unit consists of a 750mm food chamber (coupled to a 350mm firebox. Mounted centrally on the 500mm wide door is one of our thermometers. The 2 removable cooking grates in the main food chamber give a total cooking area of 700mm x 450mm. 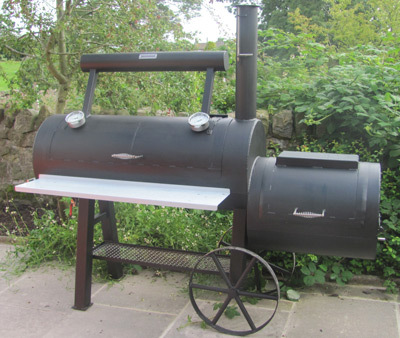 The larger "Tennessee" smoker has a 1.25m long food chamber (internal cooking racks approx 1100mm x 450mm) coupled to a 600mm long firebox, perfect for bigger hunks of meat and longer cooking times. Two thermometers are door mounted, one at each end of the cooking chamber to give you an accurate indication of oven temperature throughout the cooking chamber. Your cooking area is further enhanced by a stainless steel grill in the firebox giving you the versatility to cook directly over your wood fire embers at the end of your cookout. Food chamber 1250mm in length fabricated from 3mm stainless steel. Fire box 400mm in length fabricated from 6mm stainless steel. The design is UK hand built without compromise, every component is professional standard stainless steel and will not rust. 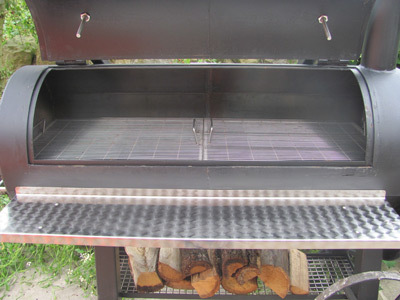 My smoker design is reverse flow to give you the best results. Heat from the fire box is channelled under steel plates along the bottom of the cooking chamber to the far end where it is then released to pass across the food and out of the smokestack. This reverse flow design gives a more even distribution of heat and smoke throughout the cooking chamber. Heat is radiated through the steel plates in a controlled manner and juices from the meats drip onto the plates, vaporise and so add to the flavour. 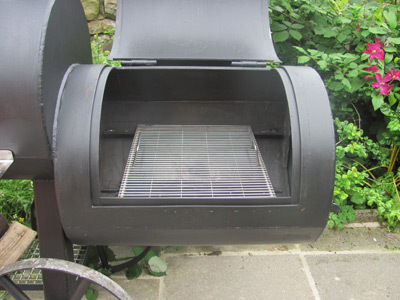 Moreover, my design also gives fuel efficiency for smoking smaller amounts, simply remove some of the steel plates along the bottom length of the cooking chamber and the heat only travels as far as you need before turning back to exit the smokestack. We pride ourselves in making our offset American smokers here in the UK. Every component is hand made and welded by us and that means no two smokers are exactly the same size. That said, if this is your first smoker purchase, it may well be your last, you won't burn through our firebox in a season. All the stainless steel used is professional grade type 304, again built to last, it won't rust. If you've researched the market you probably already know that you can buy a cheap small offset American smoker for significantly less than one of mine. I'm sure also that you'll recognise and value the quality of workmanship that goes into the offset American smokers range but which offers better value? This is where an independent voice can help. Meathead Goldwyn runs the highest trafficked independent barbecue website in the world, read what he has to say about the difference between cheap offset smokers and real ones like ours made out of thick steel. 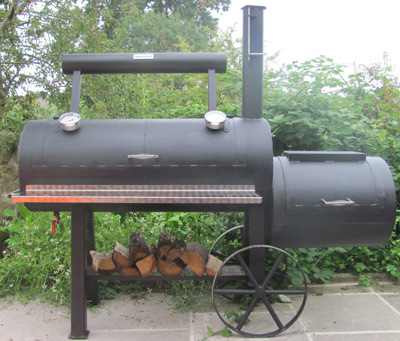 Once you've read his article we hope that you'll want to buy one of my offset American smokers UK manufactured and give me a call or complete the rapid response form below. Construction time is approximately 3 weeks from receipt of payment and of course if you want something non-standard we’ll be happy to price it up for you.